A few hours ago, a writer posted an email on the website HTML Giant. It appears that someone familiar with the writer Kyle Minor‘s work appears to have become hateful, due to certain words that the writer Kyle Minor uses within his fiction. 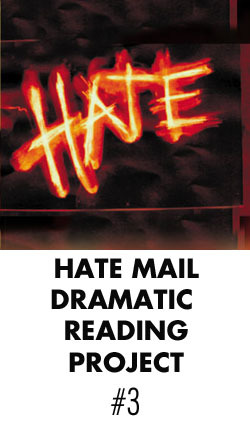 Therefore, my audio series — Hate Mail Dramatic Reading Project — must continue. The following clip represents my dramatic reading of the hate mail sent to the writer Kyle Minor, read in the style of a quiet socipath. I have also taken great care to send the writer Kyle Minor’s email to myself so that I could keep the “received in my inbox” aspect of the introduction true. I hope that sticklers for the authenticity of this series will permit me this slight digression. The way you said “Not much shocks me, anymore” made me bust a gut. These things are absolutely brilliant. Kyle Minor worked with a youth group? Harold: Haven’t you ever read the essay “You Shall Go Out with Joy and Be Led Forth with Peace” by Kyle Minor in that Twentysomething Essays book that Random House put out a few years ago? That’s his most well-known piece besides the novella “A Day Meant to Do Less” and it is all about how he walked away from evangelicalism and all that. It is also about a bully and a star fruit tree and a black man dying of lukemia. It socked me in the solar plexus the first time I read it. So you should not be surprised. Only a quiet sociopath orders books from Amazon.